Snowbelle-Mockorange - Philadelphus - Low Grower! 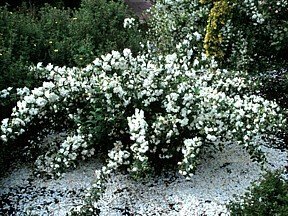 Home > Shrubs > Flowering shrub > Snowbelle-Mockorange - Philadelphus - Low Grower! After evaluating some 50 Mock orange cultivars at the Boskoop Research Center, Snowbelle was the clear winner. A low grower, with a compact habit , this plant loaded with fragrant double, pure white flowers! Only one problem, you can t import Philadelphus from Europe. Come to find out this compact beauty was developed in Canada, so now we have it. You ll love this plant!